Omega Natural Soap has been tested and accepted in the popular Trade fair Market where most successful products are marketed and distributed within and outside Nigeria. Omega Natural Soap has been tested and accepted in the popular Tradefair Market where most successful products are marketed and distributed within and outside Nigeria. Omega 1 provides your skin with basic benefits to make your skin glow, removes black spots, rebuild dead skin, repair damaged skin, tones, moisturises and improve your skin appearance. Omega 2 will make your skin glow, remove black spot, tones and improve your skin appearance. Omega 3 is for men with great fragrance and strong deodorant, and also make your skin glow. Omega 4 is best for all types of skin problems; acne, pinples, ezcima, etc. Also the best treatment for dandruff. 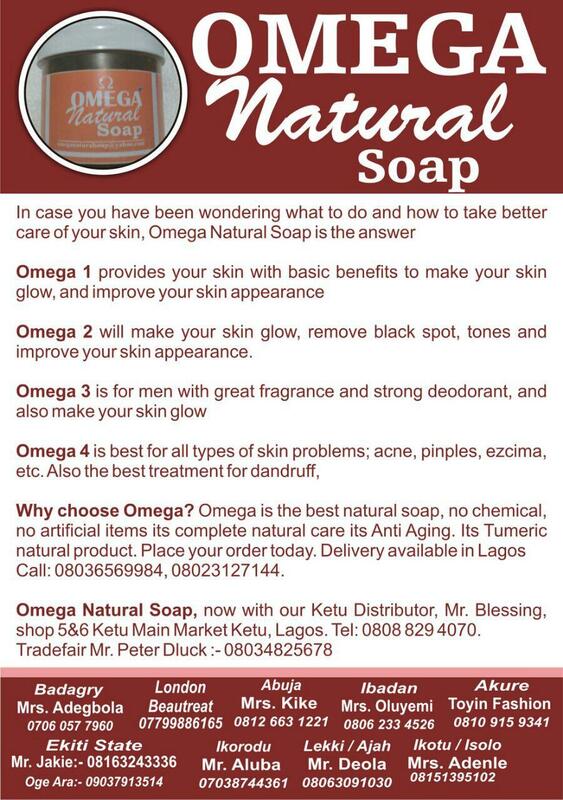 Omega is the best natural soap, no chemical, no artificial items.